Modern farmhouse style is on a roll. Cultivate the look with this beverage tub with stand. 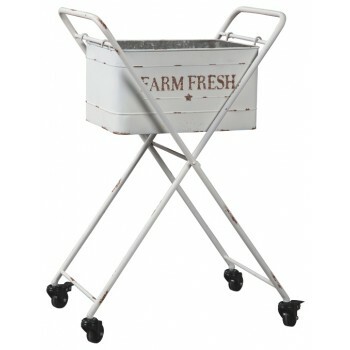 Its “chippy” antiqued white finish and stenciled details are bygone beautiful. Hung by built-in hooks on to the foldable stand, the tub can easily be removed for convenient cleaning.